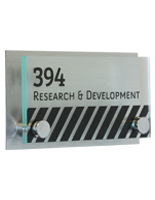 Acrylic Signs with Standoffs | Print DIY Office Door Signs Affordably! 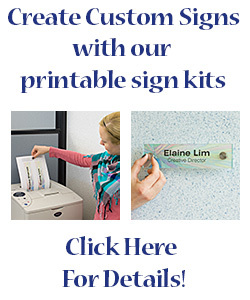 Our exclusive DSIGN series offers what sign suppliers and designers can't: an affordable sign-making system. 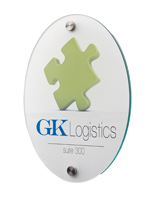 Averaging around $25 per style, this fabulous-looking door signage emulates the appearance of plate glass at a fraction of the cost. 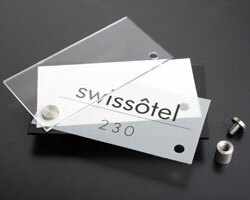 We supply all the components (acrylic plates, standoffs, printable film, design templates). All you need to do is create your design and print! 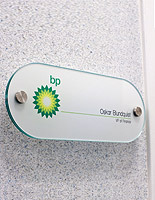 Does your office need acrylic signs with standoffs to display company signage, logos, or room designations? 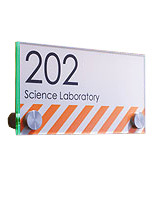 These DIY office signs greet visitors and patrons when they enter your establishment. 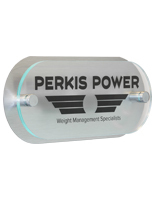 The clear acrylic signs with standoffs offer a complete sign-making solution for those looking to design their own signage and do it affordably. 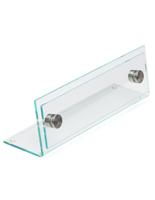 We include faceplates manufactured with green-edge acrylic plastic. 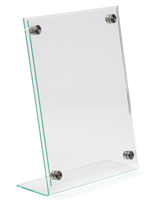 This gives the very real appearance of plate glass, but without the added cost. 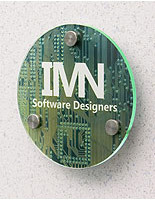 Each changeable office door sign also includes stainless steel standoffs for a professional-looking product. 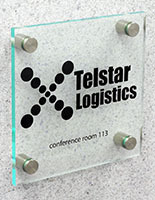 The acrylic signs with standoffs, or plexiglass door signage, come with printable film in clear and frosted styles. The choice is up to you. Downloadable templates in PhotoShop, Illustrator, and Word are all available on the website. 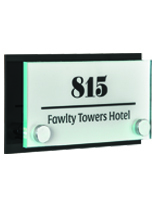 Design your DIY signage with a template, then print the film on laser printers or photocopiers. 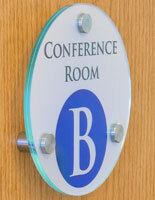 How do these interchangeable DIY office signs fasten to doors & walls? 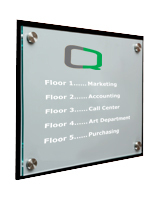 These custom acrylic signs come with either two, three, or four standoffs for installing. Level the acrylic plate on the wall and mark the hole locations. Remove the caps from the standoffs and drill holes for the screws. Install the standoff barrels to your wall, then place the plates with your print film onto the barrel and secure in place with the caps. 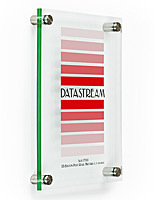 The process of inserting the film between the plexiglass faceplates is very convenient regardless of the style. If the sign needs to be changed or replaced, the task can be accomplished without removing the standoffs from the wall. Simply unscrew the caps and replace the custom print film with a new one. 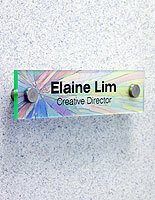 The completed result is a sharp-looking DIY office sign priced around $20! We can't stress enough the awesome value of these do-it-yourself signs. 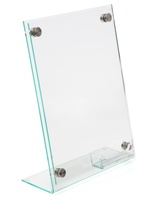 Comparable plate glass iterations are commonly priced in the $80-$100 range. Apiece. 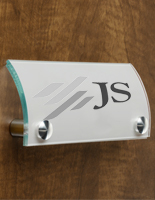 What types of businesses commonly use this door signage? 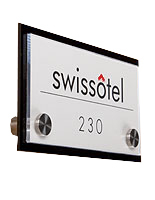 Office buildings typically use the signs to demarcate rooms and spaces, such as the location of head executives, conference rooms or board rooms. 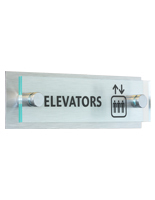 Hospitals that need to help patients and their loved ones find their way around the crowded halls will attach the message frames to walls or doors. During traumatic times, the extra help makes a big difference. 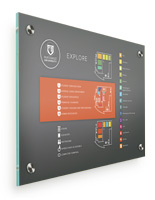 Hotels can adorn hallways with this message system to show guests the proper exit strategies in case of emergency situations. Important tools such as fire extinguishers and other supplies can be clearly demarcated on the posters. 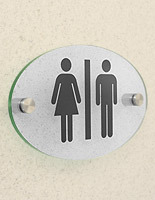 Schools often use a sign holder for designating room numbers. 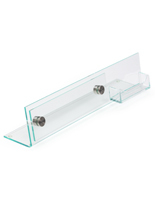 Galleries may also use the plastic panels and hardware next to artwork or other items. The signage is ideal for letting people know who created the piece or what the artifact is. Where does this interior signage work best within a building? 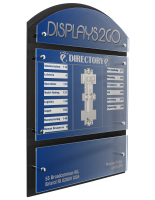 The holders can be used like office directories to display a layout of the facility to help visitors where they need to go. 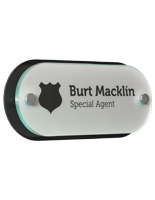 Place near the door to indicate room numbers or the nameplate of an employee. 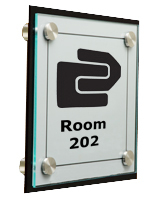 Hotels or convention centers install signage above the entrances to large conference rooms or gathering spaces so that attendees know they are walking into the correct meeting space. Museums can place frames next to artwork to offer important information like the artist's name, title of the piece, and date of completion.